The fact that some of the top colleges and universities are not offering ROTC programs on their campuses is indirectly alienating some of the brightest college students from service. If a student really wants to participate in ROTC and their school doesn’t offer a program, they can travel to another campus. The problem with this is that not all students go into ROTC right out of high school. If there is no example of how ROTC works on a campus, freshmen and sophmores won’t enroll which is a loss for both those individuals and the military. While military service is not for everyone, it is important to see universities and colleges embracing those that choose to serve and offering these courses on their campuses. 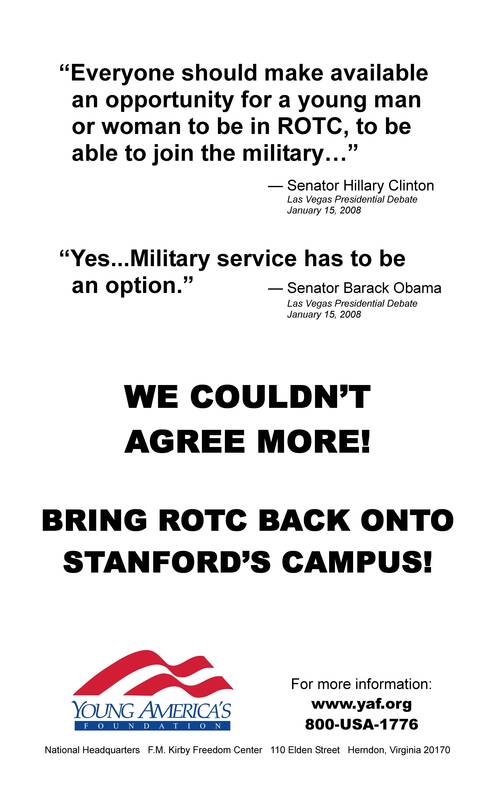 While Stanford is considering reinitiating ROTC hopefully other schools that enforce the ban will follow suit. The message sent to those considering service should be a positive one. Those choosing to serve should have the opportunity to fulfill their ROTC obligations on their campuses instead of having to travel to other schools. This entry was posted on March 9, 2010 by majastevanovich in Military and Troops News, Military Recruiting and Marketing Strategy and tagged College, Higher Education, Military, ROTC, ROTC Ban, Stanford University, Troops.